Shaklee B-Complex contains all eight essential B vitamins in a balanced formula. It is made from Brewers and Torula Yeasts, two of the richest natural sources of B vitamins. (1) Helps to fight stress. (2) Assists in nervous stability and improve thought process. (3) Converts food to energy. Available in 2 different size container. Servings per Container : 330 Tablets. Serving Size : Up to 10 Tablets per day. Servings per Container : 700 Tablets. Shaklee Alfalfa Complex, originally developed by Dr. Forrest C. Shaklee, contains only nature’s premium quality alfalfa, grown without fungicides, bactericides, synthetic hormones, growth regulator or chemicals. (1) Included in diets to help combat asthma and allergies. (2) Traditionally used as a supplement to help resolve kidney, bladder and prostate disorders. (3) Consumed since ancient times for its anti-arthritic, anti-diabetic and anti-ulcer activity. Servings per Container : 30 sticks (1.2 gram each). Serving Size : 1 stick. Developed by the Immunologist Dr. Yasuhiko Kojima. After an exhaustive review of thousands of compounds and 200 herbs, Dr. Yasuhiko Kojima isolated four ingredients (Pumpkin seeds extract, Safflower flowers extract, Plantago Asiatica seeds and Japanese Honeysuckle flowers extract) that promote general well-being. A Shaklee exclusive, NutriFeron is a patented, clinically proven blend of immune-strengthening plant extracts. 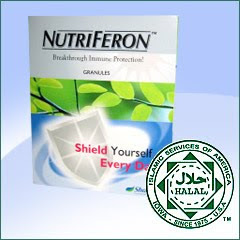 Taken daily, NutriFeron strengthens immune response by boosting the body’s natural interferon.